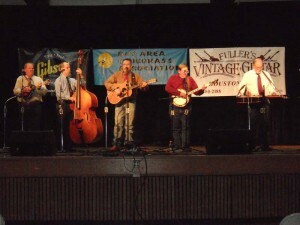 The Saltgrass Band will be one of three acts providing the bluegrass/newgrass sound at the opening concert of the 2011 Roots Music Series on Saturday, May 28 at Fredericksburg’s Pioneer Museum. Information at www.pioneermuseum.net. The 10th season of the Roots Music concert series at the Pioneer Museum will feature top musical acts, many performing for the first time in Fredericksburg. The kickoff concert is a night of bluegrass and newgrass on Saturday, May 28, with Tennessee Valley Authority, Sugar Bayou, and the Saltgrass Band. The award-winning Tennessee Valley Authority Bluegrass Band has headlined music festivals across America, performing with Bill Monroe, Johnny Gimble, Flaco Jimenez and Junior Brown. Sugar Bayou plays eclectic acoustic music that includes folk, swingy bluesy jazz, Celtic, bluegrass, Cajun, South American, and a touch of Texas rockin’ country. The Saltgrass Band has performed their deep roots, traditional bluegrass sound through the South for three decades. The evening concludes with the more traditional bluegrass sound of The Saltgrass Band. This five-piece group’s repertoire includes deep roots and bluegrass gospel. At every concert, the Longhorn Street Cafe is serving up grilled-to-order rib-eye steak or thick cut pork chop, twice baked potatoes, green beans, dinner roll and peach cobbler. Serving begins at 5 p.m., with music underway from 6 to 10 p.m. Guests can purchase wine, beer, sodas, and water. The Pioneer Museum is located at 325 West Main Street in Fredericksburg, with event entrance on Milam Street. Parking is free, and guests are welcome to bring their own lawn chairs. Net proceeds support the mission of the Gillespie County Historical Society. For information: 830-997-2835.